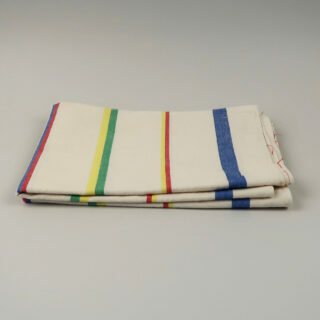 I imagine that these tea towels date to the 1970s but . . . . that is just a hunch. The ground material for both designs is an unbleached oatmeal cotton complete with flecks and the stripe is woven through the fabric. There are 2 different stripes. One of the towels is just red and green stripes with the stripes narrowing from the outside in. 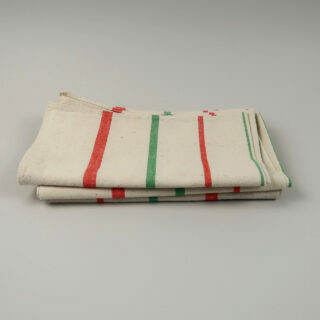 The two red stripes at the side of the towel are the widest and the green stripe in the middle is the narrowest. The other design has 4 colours, blue, red, yellow and green again of differing widths. 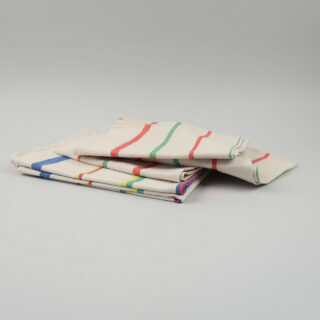 The tea towels are fairly rudimentarily hemmed at the edges with a few loose threads here and there, that are all sewn in place and unlikely to unravel.